Rewind to 1980. Sushi was new to America, video rental stores were hot, tanning salons were an inviting curiosity, and Entrepreneur was publishing its first annual edition of the Franchise 500. That means this is our 40th edition -- which is a good opportunity to step back and look at how much has changed in the world of franchising. The short answer: Franchising’s business model has changed little in 40 years, but franchises themselves have changed a lot. Dig into our list this year, and you’ll see this tension of old and new. The casual consumer may associate franchising with America’s biggest brands -- McDonald’s, Subway, and others that have defined Main Street for decades -- but in truth, the franchising industry is constantly refreshing itself with new players. The top 10 companies on our list are evenly split by longevity: Half began franchising before 1980, the other half after. 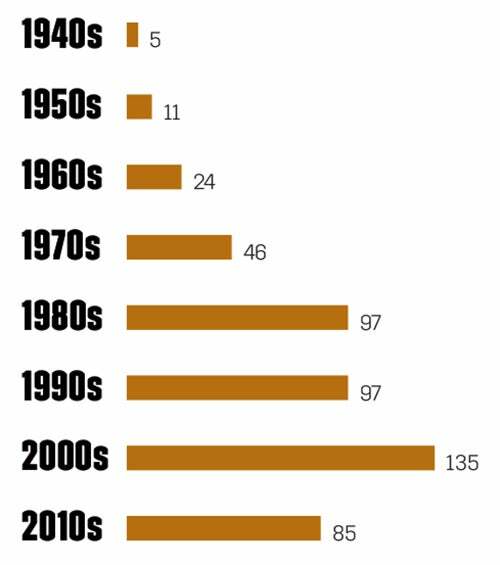 Of the full 500 companies on our list, however, only 86 started franchising prior to 1980. The average ranked company has been franchising for 25 years. We also have some true newbies: Twenty-two of the ranked companies have been franchising for five years or less (since 2014). Two even made it into the top 100: SafeSplash/SwimLabs/Swimtastic, at number 85, and Urban Air Adventure Park, at 97. In fact, SafeSplash and Urban Air together tell a bigger story of how franchising is evolving. Franchises aimed at kids, which were barely a thing in 1980, have been growing steadily recently. This year, 1,094 companies applied to be on the Franchise 500, and 111 of them were children’s businesses. (Of the 111 companies, 45 ultimately ranked on our list.) We even added a Swimming Lessons category to the list this year, and three of the four swim school businesses listed ranked in the top 100. Childcare franchises also continue to perform well, along with enrichment and tutoring businesses. Related: A Good Accountant Is Key to a Good Franchise Operation. Here's How to Find One. Recreation is still a small category overall, but the individual franchises within it continue to experience a lot of growth -- particularly with concepts that barely existed a decade ago. Trampoline parks like Urban Air are doing very well. The paint-and-sip studios are also still popular, but their growth did slow a bit this year. There are also several new “DIY studio” franchises (where you make rustic-looking signs and other decor) that may challenge the paint-and-sips, though none of them made it into the ranking this year. Elsewhere in franchising, food is still, of course, the dominant category. It’s long been franchising’s heavyweight, making up 24 percent of ranked companies this year, and we see no signs of that changing. However, food franchises themselves are shifting in subtle but important ways. Breakfast and snack foods have become popular among the companies on our list. Among the franchises that applied, many featured new concepts that offer healthful/special diet options, like fruit bowls, gluten-­free food, plant-based food, and more. Most of those ended up too new and small to be ranked, but they may be what we’ll see more of in the future. Meanwhile, the raw numbers inside the Franchise 500 tell an interesting story. The 500 ranked companies had a combined total of 533,125 units open and operating as of mid-2018, and about 36 percent were franchises outside the U.S. -- a sign of just how open international opportunities are. However, we’re also seeing a slight slowdown in unit growth: The top 500 companies added a net total of 13,935 units from July 2017 to July 2018, but in the previous year, net growth was +18,637. (The year before that, it was +15,655.) We’re also seeing a continued shift away from company-owned units, with the top 500 franchises having a combined 2,426 fewer of them than a year earlier, as large, publicly traded restaurant brands such as Pizza Hut, KFC, and McDonald’s are selling their units to franchisees. What will become of all these changes? Only time can really tell. Stay tuned for our 80th-anniversary issue in the year 2059, full of…self-driving-­car-rental franchises and intergalactic travel agencies? Whatever it is, we know change will keep coming. Check out 2019's Franchise 500 list here, and click below for more coverage on the brands that made the cut.